Blue Works has over 30 years of combined experience of extending the life of underground sewer and drainage structures without costly digging or lengthy interruption. Chances are good that we’ve got you covered with a cost effective solution. Pipe Liners from 3″ to 96″ diameters are successfully installed on a daily basis. Blue Works CIPP liners can be installed in round, oval, egg-shaped or square box brick sewers. 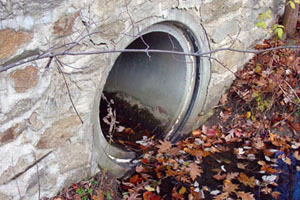 Storm Drains are made of Concrete, Corrugated Metal, Clay and Other Materials, storm drains and culverts eventually deteriorate to the extent that they allow sand infiltration, water ex-filtration. The most common consequences are that the ground above the storm drain settles or caves in, which endangers buildings, roads, homes and other structures. Of course, ordinary storm flow is interrupted which causes flooding. First the storm drains are cleaned using a Jetter and De-Silting Device, Commonly known by a popular manufacturer “Vactor” to remove sludge and physical debris. Next an internal pipe video inspection is performed to determine the distance of pipe to be lined. Next the storm drain pipe is lined with a fabric felt tube that has been saturated with resin. The lining is inverted or pulled into the pipe, inflated, and then cured using hot water or steam. Sometimes the piping is lined with Spin Casting, either way the resulting new inner pipe is designed for load bearing applications such as storm drains located under roads or railways and is approved by the DOT. Blue Works in Commonly called in to repair brand-new HDPE pipe that has been slightly mis-installed and a deflection in the pipe that creates an area in the piping that may deteriorate faster due to Storm Water Erosion causing a premature failure in the new piping.